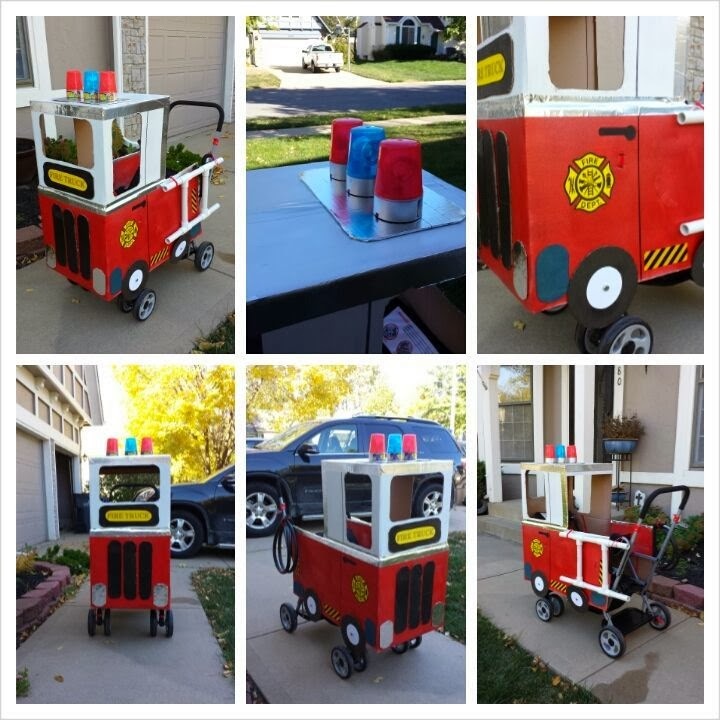 It took me 2 weeks of getting up at 5:30 am but I finally finished the double stroller firetruck with 1.5 hours to spare before our Church’s Trunk or Treat party. 🙂 Since time was of the essence on this project, I didn’t stop to take any pictures but below is a list of materials I used to make this a reality. The shell consisted of two cardboard boxes that I picked up at Home Depot. The body was their “large” box and the cab was their “medium” box. The various cutouts were from said cardboard box extra pieces. The boxes were hot glued together after my 1st attempt with duct tape failed. The cold of the garage caused the tape to detach from the cardboard. Hot glue worked the best. The paint was left over spray paint from other projects. The ladder is left over pvc pipe from last years halloween costume and from the rain sprinkler I made during the summer. The hose was from our garden. The decals were clipart I found on the internet and then printed off on plain yellow construction paper. I attached them to the truck using a glue stick. The fire truck itself is attached to the double stroller using velcro straps. In total, I spent about $10 on this.